The Hukilau: The Drink, and THE EVENT NEXT WEEK! Wow, seems like just yesterday we were at The Hukilau 2012, and here it is a few days before the kick-off of The Hukilau 2013! There are a TON of parties, events, entertainment and Tiki-tastic vendors this year, so much that I’m going to be lazy and pub the press release here for you to go through. You can also visit The Hukilau website for additional info, photos and more. Tix are still available, but they won’t be for long! 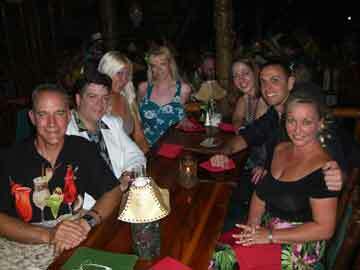 We’re going to The Hukilau…look for me, I’ll be the guy in the Hawaiian shirt. 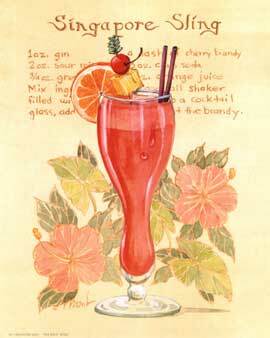 For The Hukilau Drink Recipe, scroll to the end. artists and vendors from across the globe. 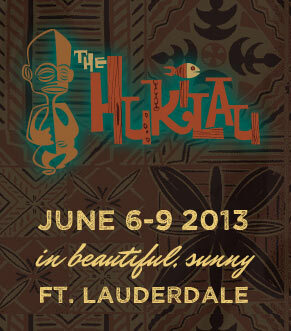 WHEN: Thursday, June 6, through Sunday, June 9.
at http://www.thehukilau.com/2013/tickets … Online sales end June 4. 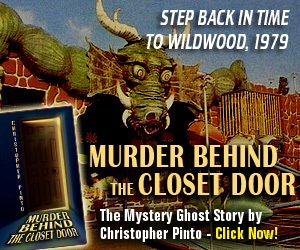 Clipper lobby on June 6 (noon to 10 p.m.) and June 7 (10 a.m. to 10 p.m.). Eating Mermaid performs in the Yankee Clipper pool, 1 a.m.
Volunteer at The Hukilau 2011 for free tickets! The wonderful kids running The Hukilau in Fort Lauderdale, Florida are looking for volunteers to help on-site during the event. A few hours of volunteer work will get you a special 3-Day pass to The Hukilau! This can save you a lot of lettuce, lettuce you can use for more Mai Tais and Crab Rangoon. The Hukilau 2011 is celebrating their 10th anniversary this year, so the festivities promise to be swankier than ever. It will be held mainly at the Bahia Mar Hotel in Fort Lauderdale, with additional events at Bahia Cabana, The Yankee Clipper, The Fort Lauderdale Museum of Art, The Mai Kai and more. Dates are June 9th through 12th. Your truly, Tiki Chris will be there for the duration. I’ll be helping out this year as Vendor Coordinator, so if you’re planning on setting up a table at the event, we’ll become good friends in a short time! Even the name of this bright red cocktail evokes the essence of exotic, taking you to mysterious, far-away places without leaving your bar stool. 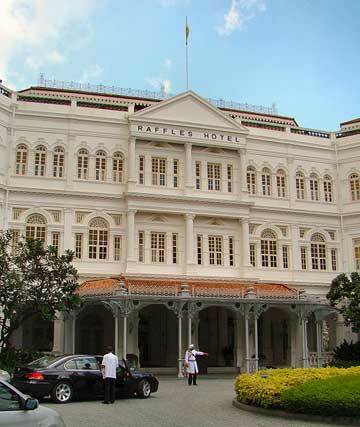 Developed at the Raffles Hotel in Singapore around the turn of the century, a modified version of the original is still served there today. Throw together everything except the soda and garnish in a shaker. (If you’re not sure which ingredients are the garnish, please put down the shaker and ask an adult to supervise.) 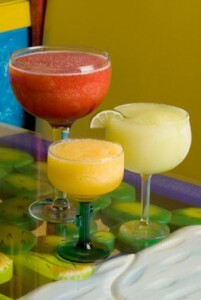 Shake it up,and strain into a hurricane or highball glass with a few rocks of ice. Top it off with a splash soda water. Garnish with a cherry, a pineapple slice, and orange skewered on one of those little plastic pirate swords. This less interesting but still very groovy tasting alternative is much more popular today, and a hell of a lot easier to concoct. Generally if you order a sling today, you’ll get a nice red gin drink. It’s good stuff. Toss everything into the shaker except the soda and ice cubes and shake, shake, shake Senora. Strain over the rocks in a hurricane glass and ad the soda. Then garnish as above. Make sure you use the pirate sword or it’s not a sling. A little plastic monkey or mermaid on the side of the glass is an added bonus. We’ll be sipping Singapore Slings at the Wreck Bar tonight as we watch the enchanting Marina the Fire Eating Mermaid and her pod of sea lovelies swimming it up in the hotel pool. It’s always fun to watch the mermaids do their underwater antics. If you’re Fort Lauderdale, stop on by! 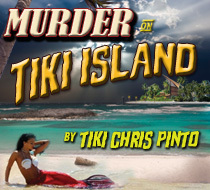 -Tiki Chris Pinto reporting from behind the bar at Pirate’s Cove Tiki Bar, in the kool little corner of my lanai. After an extensive remodeling, the Sheraton Yankee Clipper in Fort Lauderdale is open and the Wreck Bar is in full swing! (I haven’t been there yet, but I hear it’s been preserved as original). Well I’ll know for sure tonight, because a bunch of Tiki friends and I will be swinging by tonight to watch the Mermaids swim again! 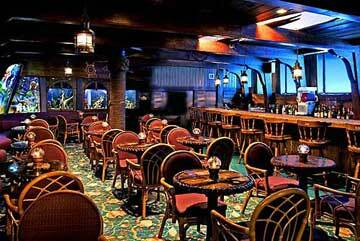 When Sheraton announced plans to remodel the old Yankee Clipper (and give it the dumb, dull, corporate, generic name “Sheraton Fort Lauderdale Beach Hotel”) everyone thought that would be the end of the historic Wreck Bar. Well, from what I hear someone had enough brains to keep it intact. The Wreck Bar features windows that look out into the pool, giving patrons a view of the swimmers. Underwater dancing Mermaids have been a popular attraction for years, and our favorite Mermaid, Medusirena, will be headlining the swim tonight. 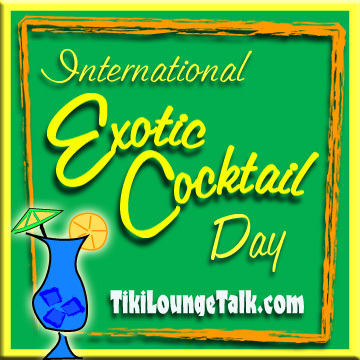 If you’re in the Fort Lauderdale area come on by and join us for a Mai Tai. Show starts at 6:30! 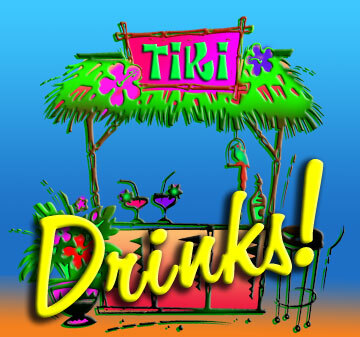 -Mermaids at the Wreck Bar, Tiki Chris @ Tiki Lounge Talk, the Tiki Blog for hip swingers and Tikiphiles. 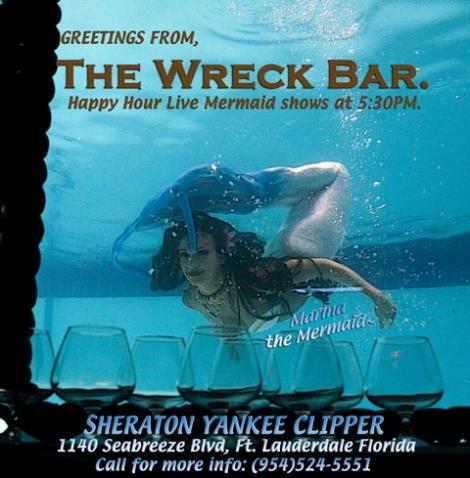 On Friday, May 29, I had the opportunity to see what is possibly the last Mermaid Show at the Sheraton Yankee Clipper Hotel in Fort Lauderdale, Florida. I, my wife Colleen, and Captain Steve set sail for (ok, we drove to) Fort Lauderdale Beach just to see the show. The hotel, famous for being built in the shape of a cruise ship, is scheduled for a total “gutting” and renovation this summer, along with the world-famous Wreck Bar and its Mermaid show. 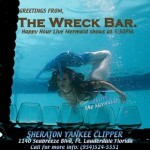 It’s unclear if the Wreck Bar will survive the transformation, and if it does, whether the Mermaids will be back. 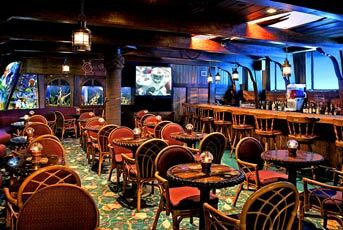 The Wreck Bar was featured in the movies Where the Boys Are and Analyze This, with the beautiful swimming mermaids visible through the glass windows to the swimming pool. Hopefully the corporate bobble-heads that run the Sheraton will realize they have a responsibility to preserving, at least in some capacity, one of the landmarks that made Fort Lauderdale worth visiting to begin with. The Mermaid show was packed…we couldn’t get near the windows, or even get a seat. Surprisingly there were lots of kids there to watch the pretty mermaids. (Yes, kids in a bar. But their parents were spending money, Sheraton!) The ladies performed for about an hour, and then without any ceremony simply waved goodbye and swam away. The bar itself was nothing like it looked in old photos. Apparently a lot of the old decor has been removed, possibly by employees taking souvenirs of the bar before the wrecking crew…wrecks…the Wreck Bar. Here are some photos from the Wreck Bar. I tried to get more but there were just too many people in front of me! It’s sad to think that something so very kool that survived 50 years of changing trends might disappear to be replaced by a common chain restaurant or “trendy” martini bar. Sheraton people, if you’re reading this…we have enough of that junk. Keep the Wreck Bar, retro is in, baby!